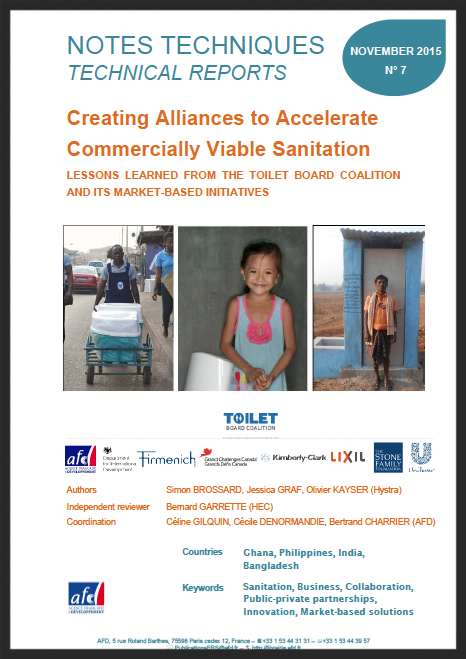 The Toilet Board Coalition (TBC) is a global alliance of corporations, government agencies, multilateral institutions, sanitation experts and non-profit organizations. It aims to bring sanitation to millions of families by catalyzing and accelerating scalable market-based initiatives. As the TBC was officially launched in November 2014, this report presents a “12-month check-up” of the alliance. Hystra consolidated insights working closely with the TBC during its inception then acting as its Secretariat, complemented with a series of interviews with TBC members, partners, and initiatives. The paper starts with an overview of the TBC and its initiatives, and then draws key lessons for a wider audience in the development and business community. More specifically 5 lessons are on catalyzing innovative market-based initiatives, and 10 lessons on launching an alliance working towards combined social and business objectives. While the lessons are primarily drawn from the TBC’s experiences, Hystra have supplemented them with insights, experiences, and anecdotes from senior representatives of other global alliances, including the Cities Climate Finance Leadership Alliance, the Global Alliance for Clean Cookstoves, the Global Alliance for Improved Nutrition, and the Livelihoods funds. The Report was published in AFD Technical Reports collection, and sponsored by the TBC Steering Committee organizations: AFD, DFID, Firmenich, Grand Challenges Canada, Kimberly-Clark, LIXIL Corporation, The Stone Family Foundation, and Unilever. It also benefited from the independent review of Bernard Garrette, Professor at HEC Paris, specialist of global alliances and BoP strategies. WEBINAR 28.04.2016 - Partnerships: Why are they hard, why are they necessary, for inclusive business results?